Social media can be a brilliant platform for businesses to interact with their customers, but every once in a while, a Facebook post or tweet is posted that is so inappropriate, the Twittersphere are left with their mouths hanging open. This has happened countless times over the last two years, with companies like HMV and Tesco falling under the bus. Whether it was a badly timed post, an accidental racial slur, or disgruntled employees hijacking the company account, it always seems to end the same way, with social media outrage and a series of apologetic posts. Here is our list of the 6 worst social media disasters – prepare to cringe. 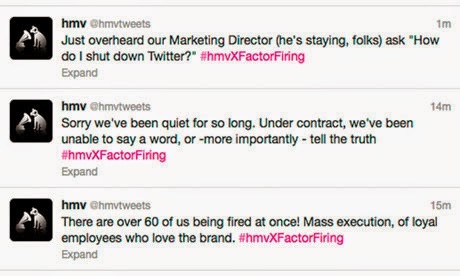 Dear HMV, when you start firing employees left, right and centre, please remember who has access to your twitter accounts. In January 2013, an employee live tweeted the mass firing of over 190 staff members. “We’re tweeting live from HR where we’re all being fired! Exciting! !” was the first tweet to surface, it was quickly followed by several others, naming the incident a “Mass execution of loyal employees”. The tweeting eventually stopped – we assume the Marketing Director finally figured out how to “shut down Twitter”. "It's sleepy time so we're off to hit the hay. See you at 8am for more #TescoTweets." Tesco immediately apologised for the post, claiming they were very sorry and “Would never intend to make light of (the situation)”. Posts everywhere emerged regarding the inappropriate tweet, ranging from the angry horse meat consumer, to the tweeter who found the post the most hilarious thing he had seen all day. Reminder: if your company is involved in a scandal that involves selling potentially contaminated meat to millions of customers, check what is in your social media queues. Just in case. 3. 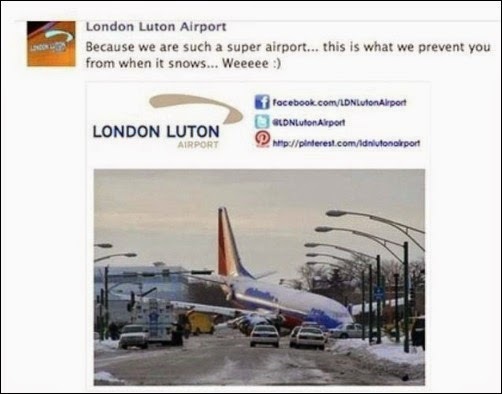 London Luton Airport learned the hard way how not to post on Facebook. A new employee at London Luton Airport decided to let passengers know how much they care with a funny, informal tweet. How sweet. Incidentally, this photo was from a Southwest Airlines flight in 2005, which in slid off the runway at Chicago Midway in heavy snow, killing a six-year-old passenger. After receiving several angry replies from Facebook users, Luton Airport removed the post claiming it was “Wholly unacceptable and insensitive.” They later added “We apologise for any offence caused. Further steps have been taken to guarantee this never happens again.” Come on Luton, check your image sources! During last year’s Boston Marathon Bombing, the last thing anyone was thinking about was scones. No one told Epicurious that, though. They posted two tweets that, despite sounding delicious, were extremely inappropriate. Now, we’re not sure if anyone is that passionate about cranberry scones, but in the name of respect, Epicurious, don’t use a national disaster to promote your baking recipes. But wait! That’s not all. The apology tweet claimed they were sorry that their “Earlier tweets seemed insensitive.” More twitter users complained that they actually were insensitive and didn't just seem that way. The apology tweet was later deleted and replaced with a more appropriate, and grovelling, response. Just two hours after the tragic shooting incident in a cinema in Aurora, Colorado, the National Rifle Association posted this tweet. The post was released at 09.20 AM by American Rifleman – The National Rifle Association’s official journal. The group was pulled from the internet approximately 3 hours later, but the post had already taken effect. This is a social media disaster that encourages disgusted looks and silent shaking heads, and is not one that can be brushed off as an innocent mistake. The NRA later apologised for the post, claiming the tweeter was not aware of the events unfolding in Colorado. We suggest taking a quick look at the day’s news before you post any questionable tweets! There is always an opportunity to engage with your customers, even during a hurricane. Wait, what? Yes, there it is - the thing people want most during a horrific natural disaster on their home state – a sale! 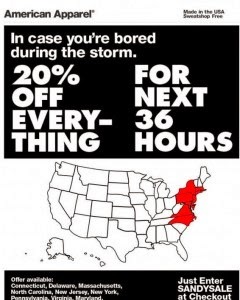 The clothing company American Apparel posted this image, offering residents of the several states being hit by the hurricane 20% off all stock. The post was hammered by social media users that were suffering in the storm, as well as those who realised American Apparel were using the disaster to increase their sales. Can you say ethics? American Apparel did apologise for the insensitive nature of their post, however, they did keep the promotion running. Let us know your thoughts on these social media disasters and if you have any others you think deserve a place on the list.